After the lunch, we continued our tour to The Tip of Borneo. It has been raining for the past few days. The weather was not good in the morning. Luckily, after the morning rain, we got a clear blue sky. 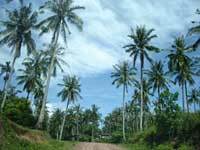 The 30 minute ride on graval road was quite an enjoyable experience, as we were welcomed by thousands of coconut trees. Before we arrived The Tip of Borneo, the white sand and crystal blue water at Tanjung Simpang Mengayau caught our attention. The beach is so beautiful, clean and pure that I call it the “Perfect” beach, something that would only appears in dream. 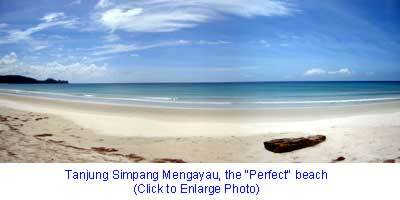 I was told that we could camp there, and the sunset of The Tip of Borneo is one of the best. I will come back again next time, for longer period. There are also a few longhouses nearby that offer accommodation to tourists. I don’t want to be wordy on describing the beauty of The Tip of Borneo. Just check out the photo gallery and see it yourself. Actually we are not allowed to go down and walk on the rock. But I just could not resist to get closer to the tip. If you check out my photo gallery later, you will know that it is quite dangerous to stand near the tip coz the strong wave would hit you to the sea.